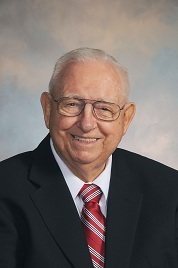 As an active attorney for over sixty-five years, Stacy Eggers, Jr. was a fixture of the legal community in Boone. From handling thousands of real estate closings, drafting countless wills, trying numerous civil and criminal jury trials, and representing local governments, Mr. Eggers has encountered most everything a lawyer could see during his career. Mr. Eggers was a life-long resident of Watauga County, and at the age of 18 entered service during World War II with the United States Army Air Corp. He was prone to joke that he received a personal invitation from the President of the United States for an all-expense paid trip around the world. While in the service, he served in the African campaign, India, and the Pacific theater. Upon his honorable discharge from the Army Air Corp following the war, Mr. Eggers studied law under the tutelage of a Superior Court Judge in Asheville and successfully passed the North Carolina State Bar at the conclusion of this apprenticeship. He married the former Elizabeth Bingham of Boone, and upon his passing the North Carolina Bar and returning home, he opened his own law practice and together they raised four children. In his practice of law, Mr. Eggers quickly became a successful trial attorney and transactional lawyer. He held the position of Judge Advocate General of the local American Legion Post in Boone until his passing in 2018. Mr. Eggers was an AV rated (Preeminent) attorney through the Martindale-Hubbell peer rating system, who served on the North Carolina Bar Council, the North Carolina Client-Security Fund, and both the district and county bar associations. Click here to view Mr. Eggers’ Martindale-Hubbell review. His hard work, dedication, and devotion to his profession was recorded in the Congressional Record by the Honorable Congresswoman Virginia Foxx in a 2015 session of the North Carolina House of Representatives. Click here to watch Congresswoman Foxx’s speech.